Ah, the fall. Time to queue up When Harry Met Sally and drink your pumpkin spice latte. 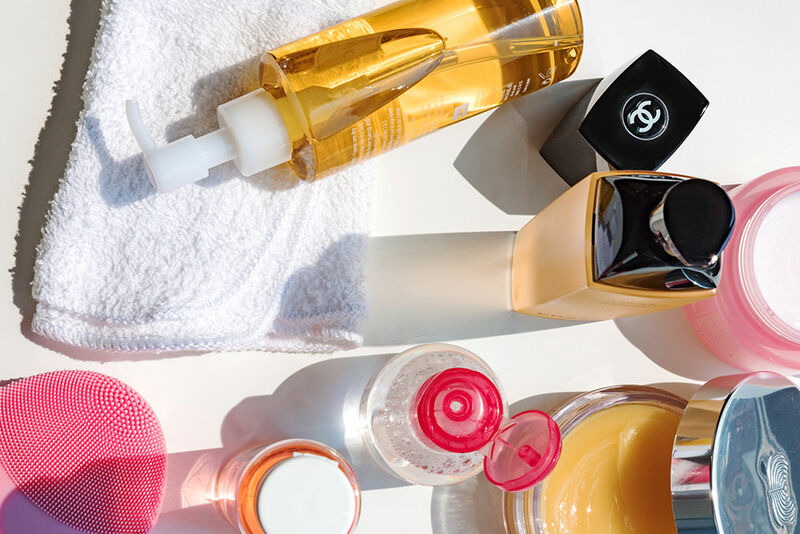 But if you’re like me, and staunchly against that sickeningly-saccharine-artificial-pumpkin-flavored-nonsense but, like, still wanna be cute, look no further and let me learn you a thing about fall eats to keep your skin glowing. Switch out all that high fructose corn syrup for turmeric and kimchi. Left field, but hear me out. Turmeric is a bright yellow spice derived from the ginger family. It’s commonly found in India and Southeast Asia, where it’s healing properties have been used for generations. Turmeric is insanely comforting during the colder months and it’s one of the best ingredients to better your skin from the inside out. Turmeric can help heal your skin–think acne, scarring, eczema, psoriasis, the whole shebang, and it’s delicious. Now, kimchi is another game-changer. Gut health is extremely important if you want healthy skin, and the fermentation of veggies in kimchi results in all those beautiful probiotics which soothe inflamed skin, eliminating wrinkles and acne. But first, a refresh on probiotics for those in the back. Probiotics are naturally occurring “good” bacteria (also known as flora) in your gut. When your probiotics are flourishing and your digestive tract is thriving, so is your skin! Kimchi is produced by brining veggies in salt, sugar, and other spices. When left to ferment in its salty, low oxygen environment, bacteria begins to grow, but in a good way. This bacteria that’s created during the process is also known as probiotics, which are keeping your skin balanced. 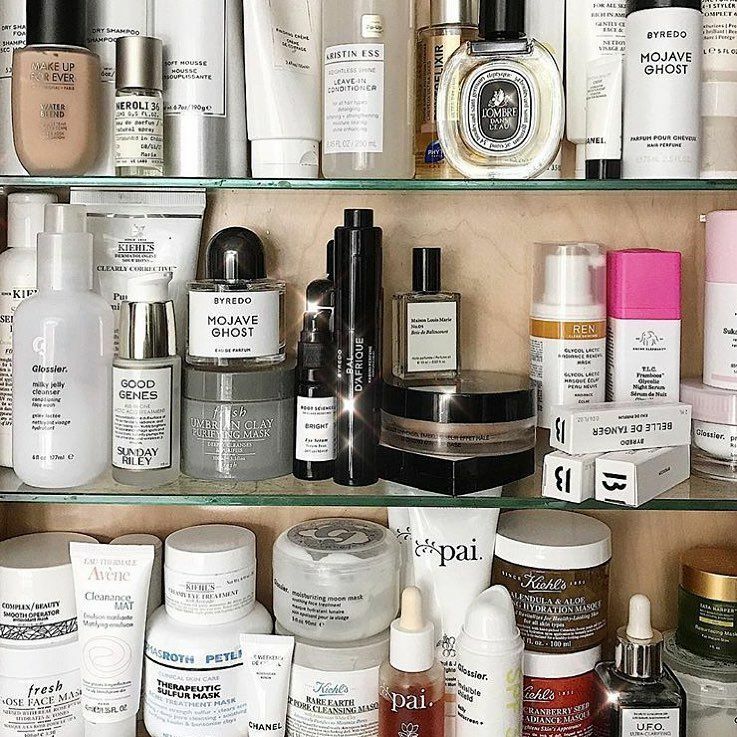 If you’re looking a little lackluster and maybe experiencing a few too many rogue zits, consider munching on some kimchi, sauerkraut, or even a pickle every once in a while. 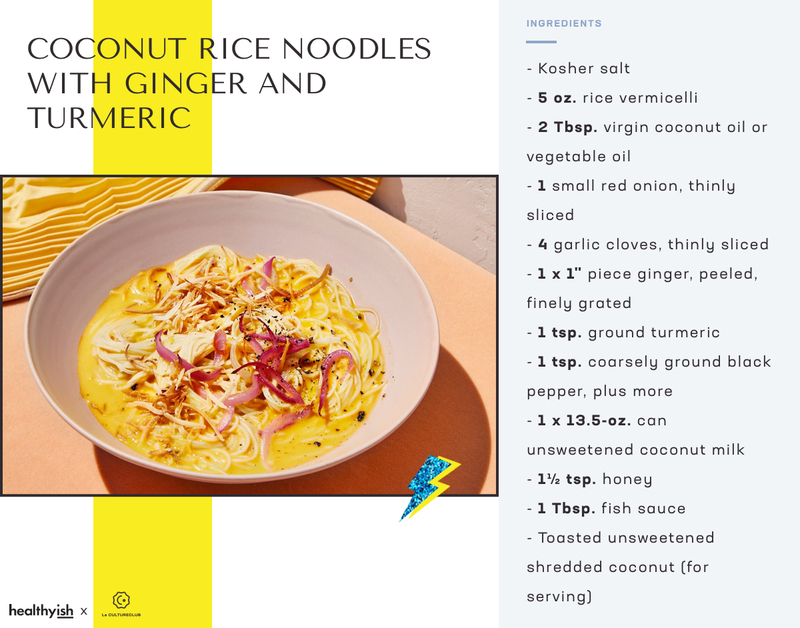 We asked our friends over at Healthyish for their hot take on some of the best recipes out there that tick our boxes: turmeric? Check. Kimchi? Duh. Great for your skin? Why would we even be here telling you about it? 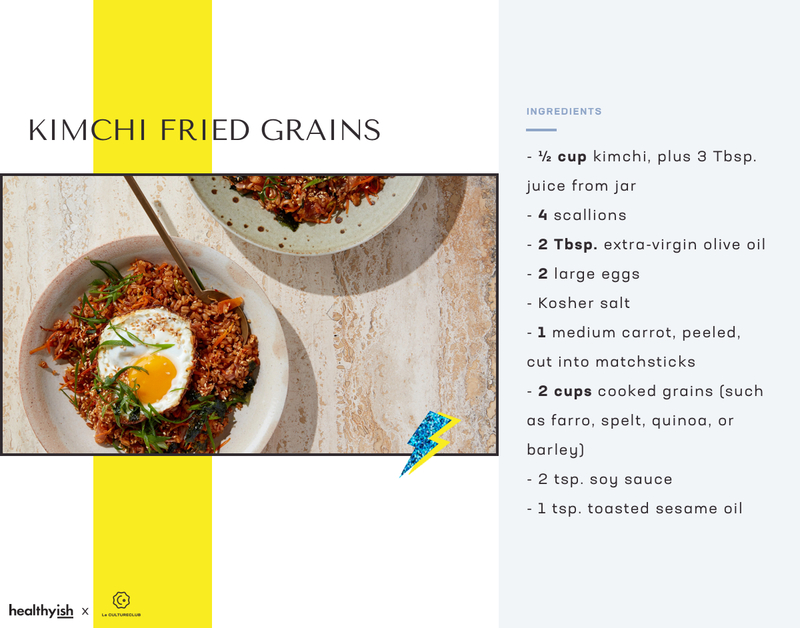 And after waxing poetic about kimchi for an entire paragraph, we wouldn’t leave you hanging without Kimchi Fried Grains. Heat olive oil in a large nonstick skillet over medium-high. Crack eggs into pan; season with salt. Cook, shaking occasionally to prevent sticking, until whites are golden and crisp around edges and puffing up and set near yolks, about 4 minutes. Transfer eggs to a plate. Return skillet with oil to medium-high heat, add carrot, and cook, tossing often, until slightly softened, about 2 minutes. Add reserved white and pale green parts of scallions and kimchi and cook, tossing often, until scallions are just golden, about 3 minutes. Add grains, soy sauce, sesame oil, and reserved kimchi juices; cook, tossing, until grains are slightly softened, about 2 minutes. Season with salt; divide between plates. Top with eggs, then nori, sesame seeds, and reserved scallion tops. *Photo by Michael Graydon + Nicole Herriot. 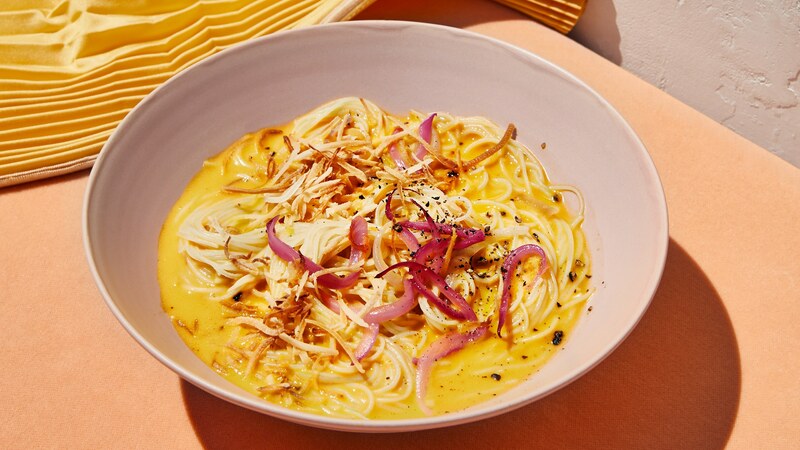 Courtesy of Bon Appétit.